I really don’t like the term “base training” because it produces images of long, slow distance training with watts at 60% of your threshold as you putter along. Too many athletes and coaches believe we have to do base training first before any other type of training can be started. Now, I’ll concede that if you’re a pro cyclist training for a huge season in Europe next year, then yes, you should be doing some serious base training right now; riding your bike four to six hours a day at endurance pace will help continue to develop your aerobic system and prevent you from peaking in January. But everyone else? Forget it. We don’t have the time to put in four to six hours a day at a slow pace, stopping at coffee shops along the way and enjoying the sights. Most of us have only an hour or two each day to train, and we have to make the most of those hours and optimize our training for the highest ROI. If we spent those few hours riding at endurance pace, what would happen? We’d lose fitness and get slower. There’s a relationship between time and intensity that must be respected; the lower the intensity, the longer you should ride in order to stress that energy system. If you really want to improve your endurance system, riding at endurance pace for four or five hours is what you need to do. A two-hour ride won’t be long enough to create the necessary stress on the body to cause it to adapt and improve endurance. So what is the correct intensity for your one or two hours of available time? 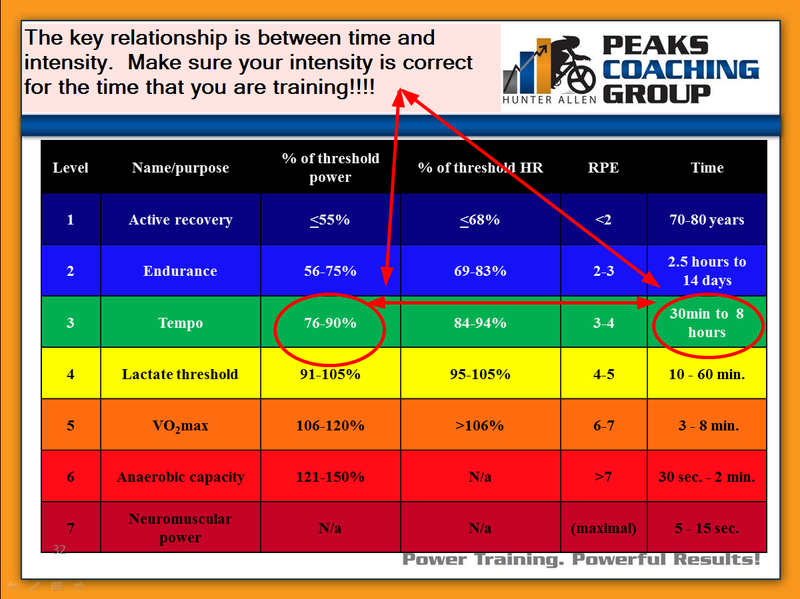 The tempo zone, Level 3 on Dr. Coggan’s power level chart, 76-90% of your functional threshold power (FTP). Riding at tempo pace is a challenge, but it won’t make you peak in January, either. By pushing yourself a little harder this winter in your shorter sessions (many of us are stuck on the trainer all winter, too), you’ll be able to stress your aerobic system appropriately enough to continue improving throughout the winter. 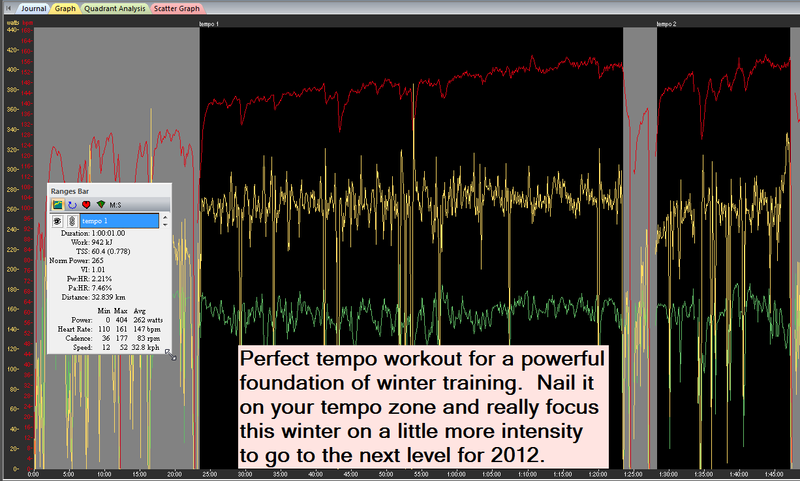 Riding at the tempo level this winter is one of the keys to moving to the next level, as it creates the training stress you need as your power foundation, which is what I prefer to call winter and pre-season training; it doesn’t conjure up those dreaded thoughts of LSD training, and it focuses on the power side of the equation, since your winter goal is to increase your power at threshold. We all want to improve our overall aerobic fitness every season, since more fitness equals more fitness, and you’ll be riding faster than previously. What types of workouts should you do this winter to make sure your power foundation is sufficiently challenged? Below are three suggestions that are perfect for both indoor and outdoor workouts, as each one can be adapted to either environment. This workout is designed to make you ride at a relatively high intensity, keeping your aerobic system taxed but not so much that you can’t do the big gear efforts afterward. The big gear intervals are done afterward since your muscles will already be fatigued from the tempo work, and you’ll have to summon more strength to do the work. The big gear efforts are there to help you create some additional muscular strength and translate any weight training you might be doing onto bike specific work. MS: Nail it for 60 minutes at 80-83% of your FTP, with 20 bursts (one every 3 minutes) for 10 seconds at 120% of your FTP. Ride easy for 10 minutes, then do 20 minutes at 80-83% of FTP and do big gear intervals: put it in your 53:13 at 50 rpm, and every 2 minutes (10 times total) slow down, stick it in the 53:13, stay seated, and use strength to push it to 90rpm. Once you reach 90 rpm, return to your tempo pace. CD: 10 minutes easy spinning. This workout is designed to fatigue both your muscular endurance and cardiovascular system. By doing two longer, 30-minute intervals at your sweet spot (88-93% of FTP or upper tempo/lower threshold pace), you’ll really have to work and stay focused, but it will be doable. After you do the 30-minute efforts, you’ll have to ride at tempo for 45 minutes but at a lower level tempo pace, which again will be challenging as it stresses that muscular endurance system. MS: 5 x 1-minute fast pedals over 110rpm, with 1 minute of recovery between each. Then do 2 x 30 minutes at 88-93% of threshold, right in your sweet spot. Ride easy for 5 minutes after each. Finish with 45 minutes at 76-80% of FTP; nice tempo, but not hard. This is your bread-and-butter winter workout. It’ll give you plenty of tempo work and will challenge your cardiovascular system. It’s sure to make you red in the face with some early hard work to wake you up. WU: 15 minutes steady and smooth, getting the legs going. These workouts are just a few of the great variations on tempo that you can do this winter. The goal is to keep improving without peaking in January and to build your foundation so you’ll be ready for more intense threshold work later. These are for riders who don’t have four to six hours to ride each day. They’ll keep your fitness higher throughout the winter than normal, but you won’t have that far to go to peak for your key event in the spring. Give these workouts a shot; you’ll be pleasantly surprised with your new higher threshold this spring! 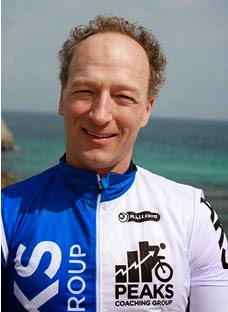 Hunter Allen is a USA Cycling Level 1 coach and former professional cyclist. He is the coauthor of Training and Racing with a Power Meter and Cutting-Edge Cycling, co-developer of TrainingPeaks’ WKO software, and CEO and founder of Peaks Coaching Group. He and his coaches create custom training plans for all levels of athletes. Hunter can be contacted directly through PeaksCoachingGroup.com. I am trying to understand the physiology for these type of WO's. Does anyone know why 5x1min efforts (fast pedal are required in the main set) and why 3mins all out effort is required for the tempo wo. My MLSS is 235W but the other day I did an all out 3min effort (probably could have gone a little faster but was cautious) and did 323W (137% of MLSS or FTP). Does this mean my threshold is too low compared to my VO2max pace (MAP == approx to 3min TT)? The 5 x 1-minute fast pedals are meant to help your warm-up by increasing the blood flow to the muscles without using too much contractile force on the muscles. In other words, you can warm up without force on the pedals or taking away from your wattage in the workout. The 3-minute all-out is another part of the warm-up, essentially. It’s made to get your nervous system to switch from the para-sympathetic system to the sympathetic system and then back again. This way when you begin the tempo work you are in the para-sympathetic system, remaining calm and collected. MLSS is not the same as FTP. FTP is higher than MLSS. MLSS is closer to your sweet spot (88-93% of FTP). If you take lactate measurements during a FTP test, the lactate will be increasing throughout the hour and peaking in the final minute. Your 3-minute power should be 115% of your FTP. Have you done a full-out 20-minute test? Or better yet, a 1-hour TT? I really hate TT's mainly cos I used to do a lot of them when younger and found them mentally destructive - in low pro position in a howling gale on a busy dual carriageway - im in the UK by yhe way. I usually use predicted MLSS wattage or DMax modified for my 1hr prediction these days. My best 25mITT was around the 57min mark - some years ago. Ive read various articles that conclude 1hr ITT performance equates quite well with MLSS or DMax wattage. since this last blog ive done a 333W average for 3mins and also a 350W MAP (20W/min from 100W). Im just starting to get fit again and intend to concentrate next year on 1-1.5 hr RR and criteriums - no ITT's. I recently measured my LT1 at 213W (@ approx 1.4mmol/L with lactate scount) using broken stick method. My current long ride is 2hrs @ approx 82% of max HR and around 210W which I class as tempo. Do you think I should change my training zones from current AIS 5 (level 1 < LT1, 2,3 split heavy intensity zone (LT2-LT1/2) and zone 4 threshold and zone 5 from LT2 to VO2max ramp or MAP)tier model to FTP model? Great question, Alan! You have done your homework. We hesitate to give a specific answer on this one, as your question is highly personal to your own physiology and goals. We would love to help, though, and would suggest hiring one of our coaches for a consulting session. Here’s the link: http://www.shop.peakscoachinggroup.com/category.sc?categoryId=19. We help athletes every day with these types of queries. Thanks Hunter. If I could ask a question on your first answer regarding PNS, SNS. So the idea is to sort of fool the nervous system in the warmup into not being shocked into adrenaline release when doing the MS by hitting it at power outputs higher in the warmup and hence then saving glycogen and increasing reliance on fat which is related to increased aerobioc capacity? I may try doing 300W for 3min blowouts before all WO's. Thanks. I appreciate the physiology behind all of this. I am a little confused about what to do on a limited training schedule. With only 6hrs available a week (3 x1hr indoor sessions + 1.5 and 2.5hrs on the road) is it still possible to get some solid gains in FTP with the methods described. Or would it be more beneficial to spend the time on Vo2 and to some degree anaerobic power (my weakness). Until my schedule frees up in April where I can clock up 15hrs a week? I am in Oz btw and race shorted RR up to 2hrs with a few 150km fondos for fun. thanks if you get the time to respond. I would like to revisit the physiology again behind this type pf WO if possible. So the 3min hard effort will increase blood flow and increase muscle plasticity and also prime the aerobic system reducing the aerobic slow component. The 5x1 min efforts (what power should we aim for in relation to FTP?) task the neuro-muscular system. I hope I have got this right so far - please say if not. Could you explain the reasoning behind the PNS, SNS. i,e. is this meaning that the activity of the SNS is reduced then when doing the main set (although this would be below MLSS). Also is the training effect of tempo down to the large reduction in muscle glycogen expected from riding so long at tempo pace (i.e. above LT1)? Thanks in advance for your reply. The reason I ask is im a final year masters student trying to put some science and physiology behind WO choices. Most work in the literature is at very large power outputs (i.e. vVO2max).